I don’t know about any of you, but I’m not jumping out of my seat to play a dice game. If I do end up playing one, it better be good, really good. Late-for-class-because-I-was-out-in-the-hallway-adding-up-my-score-good. Newton’s Dice is a fun, new 3D dice game brought to you by Mark Hessburg. If you aren’t a big dice player, you’ll get the hang of this game quick. This iPhone app makes it easy to learn and play. You can choose between three games to play: “10,000,” “Shut the Box”, and simply “Throw Dice.” The developers included a generous amount of instructions for “10,000” and “Shut the Box.” The options for each game cater to the way it’s played. For example, “10,000” has additional, optional rules you can choose from. 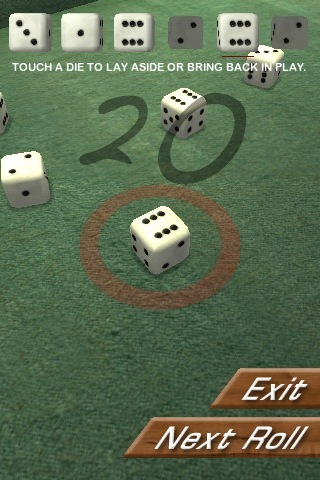 However, when I selected “Throw Dice,” I had no idea what to do. Maybe some of you who play dice know what the point of this section of Newton’s Dice is about, but I don’t, and I could have used a little instruction. When you select any option in the game, there is a short sound clip of dice in a cup, and the background music fits well into the sophisticated feel of the game. The developers also included accurate sounds of the dice falling out of the cup and rolling around on the board. The graphics are amazing. It’s all clean, clear, and in 3D. The dice aren’t popping out at you or anything, but you definitely have more than just a bird’s eye view of little white squares falling onto a table. To roll the dice, you actually have to shake your phone; this allows Newton’s Dice to become more interactive than most other dice games. This game takes a little bit longer to load than most of my apps, but maybe that’s just because of the graphics and sounds this app carries. It’s clear that a lot of attention was paid to the aesthetic of this game. There are tons of dice game apps out there, I lost count at 20 in the iTunes store, and Mark Hessburg figured out a good way to set Newton’s Dice apart from the bunch. AppSafari review of Newton’s Dice 3D was written by Amanda McFarland on May 12th, 2010 and categorized under App Store, Games, Mini Games. Page viewed 4729 times, 1 so far today. Need help on using these apps? Please read the Help Page.